Hi friends! If you are anything like me, you are probably getting so ready to see some sunshine. Christmas has long since faded. We made it through January… and February has us starting to long for Spring! Now, I’ve got sometime before the sun is back. Really back. Springtime here is wet. And long. We kind of go straight from Winter to Summer. But, our Summer. Oh our Summertime is glorious!! This month, Better Homes and Gardens wanted to see how we are going to be entertaining for Spring. 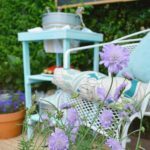 In the warmer months, we usually have a patio set, lots of flowers, and sometimes even our BBQ, right on the patio off our sun room. 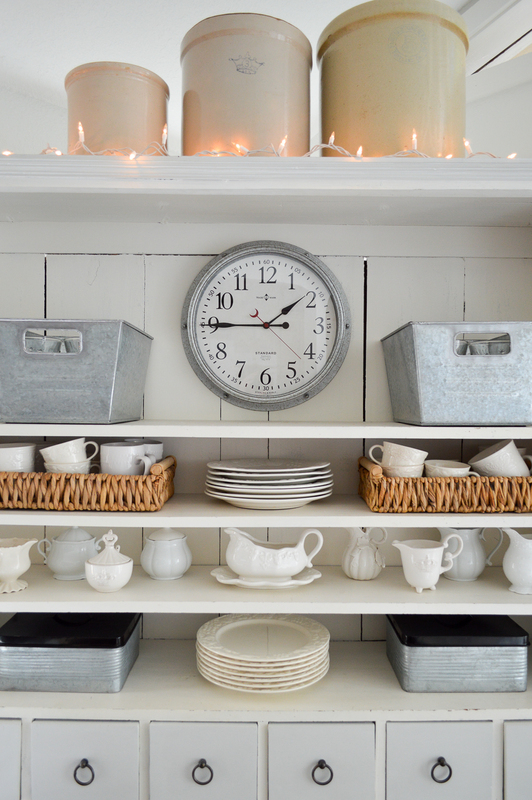 For us, it makes sense to have things right here, where they are easy to get to when we’ve got company over. 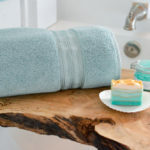 Even in late Spring and Summer, we tend to get showers so I like to have someplace safe (and dry) to keep things handy, yet out of the way for everyday life. 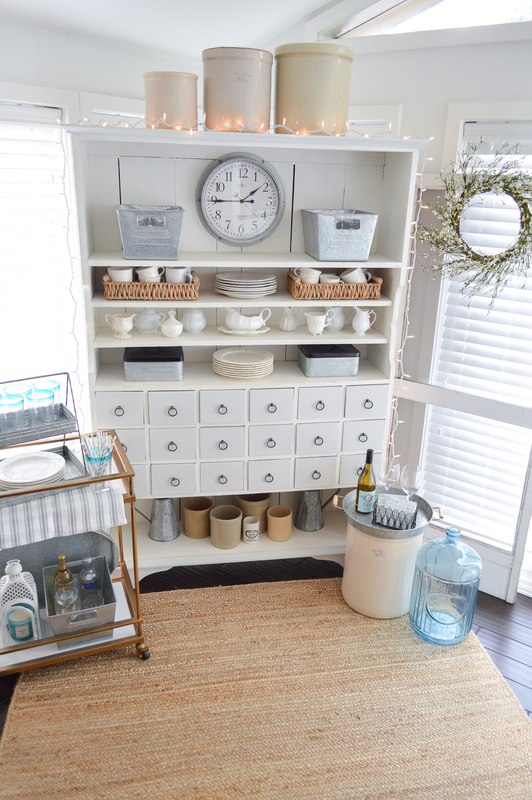 The apothecary cabinet is the perfect place to store extra dishes and such. 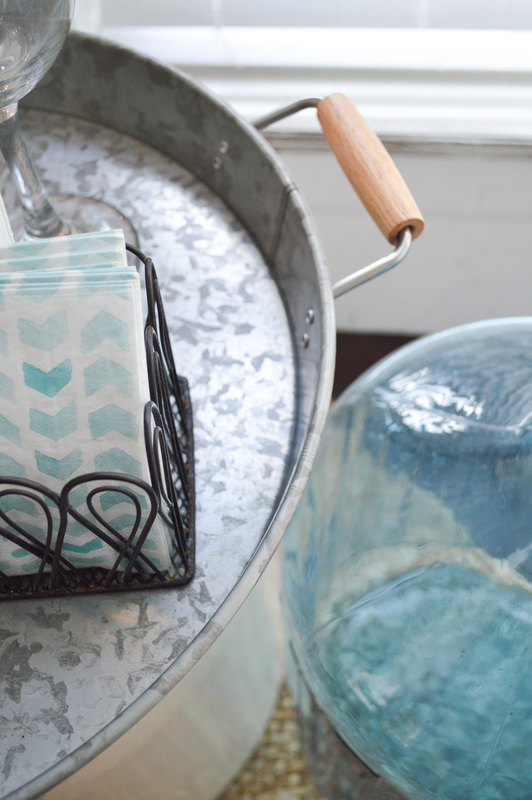 Two of my new galvanized bins are filled with glassware – I thought that would make it really handy to cart them over the the sink for a quick wash, so I can always be ready for a party in a jiff. 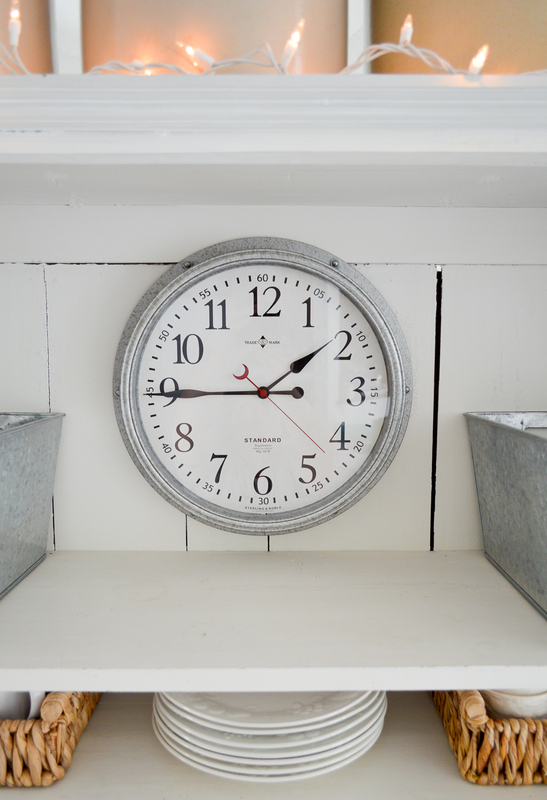 I already need to order another one of these galvanized clocks. Because Jim wants one for the workshop! It’s got a really cool vibe and feels a bit nautical. 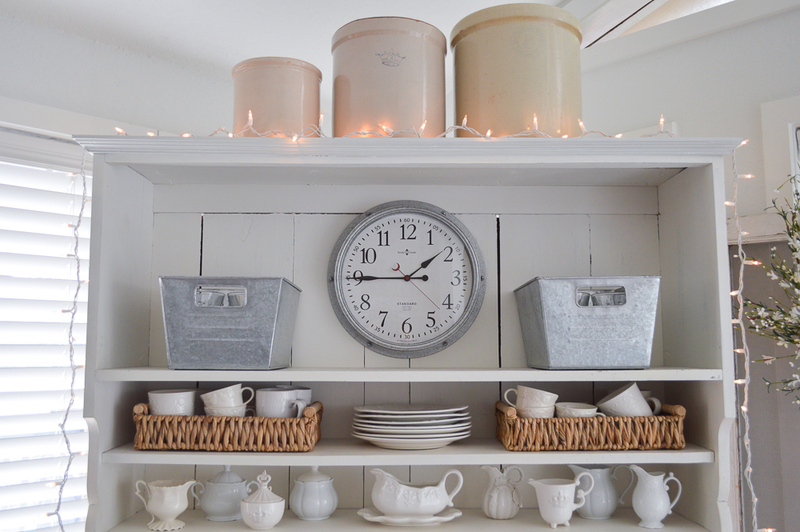 I don’t have a single clock in the house and it’s perfect here. Now, when a Spring storm knocks the power out, I’ll be able to see what time it is. Because ever other clock in the house will be flashing. (it’s always so fun to go around re-programming them!) Plus, I can see it from many locations on the upper floor. It’s my favorite thing I ordered!! 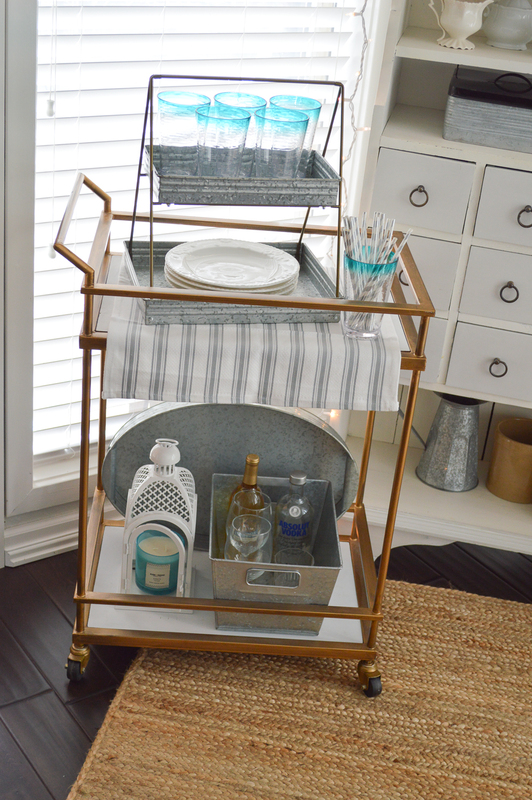 My bar cart is working perfect here in the sun room, and I added the two tiered tray, some fun aqua rimmed glasses, and metallic silver paper straws. 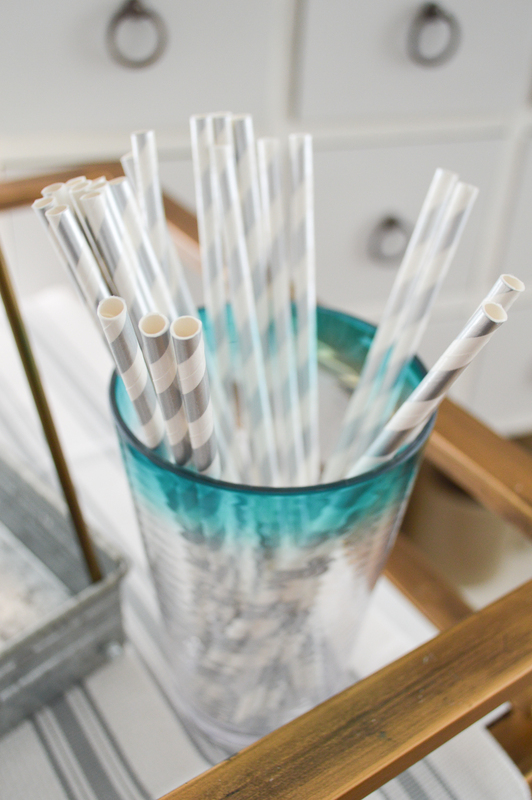 Can anyone tell me why paper straws are so damn cute? I stinking love them. 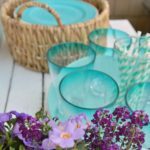 The bottom level has a lantern ready to pop outdoors, a big oval serving tray at the ready, and a bin full of wine glasses, rocks glasses, and happy juice. 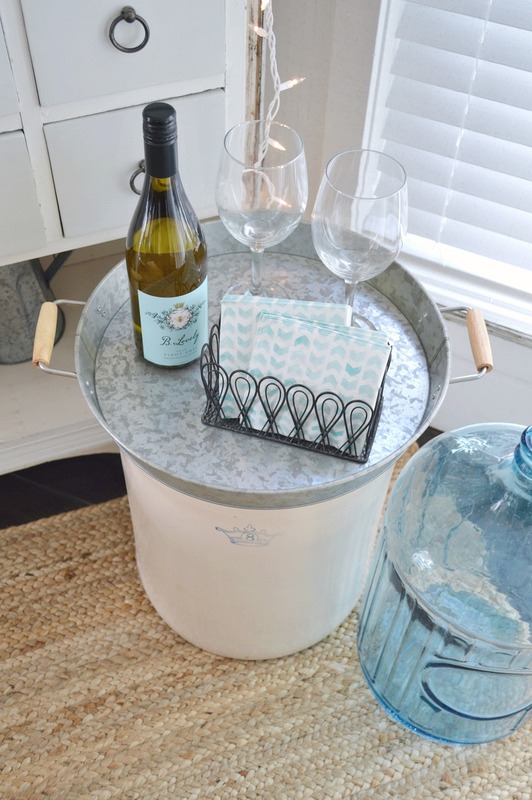 I used one of my round trays from last season, and popped it on a crock as an impromptu table. 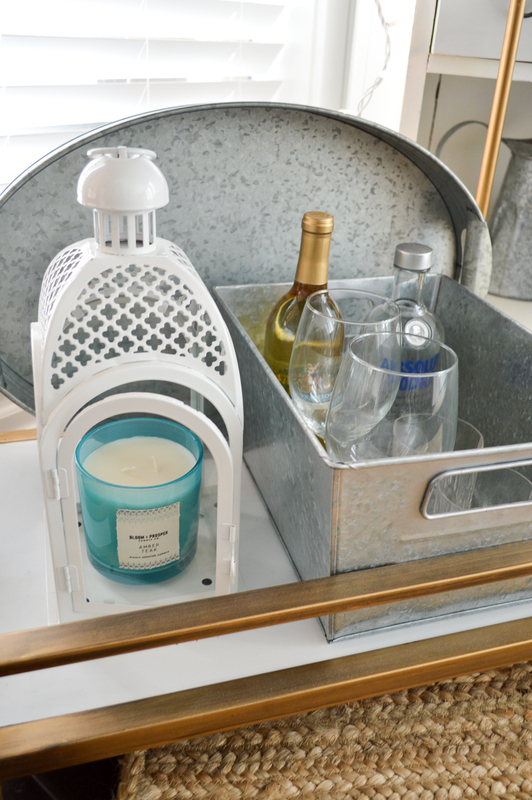 Tray are so versatile. I love them!! 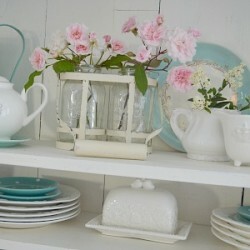 I’ve put them on top of bar stools before too (like here). In fact, I ordered the cutest bar stools but there was a little mix up so I’ll show them to you later. Plus a little something else that’s still en route. I’m pretty much in galvanized metal heaven here at the hollow. Love the stuff! It’s neutral. Sturdy. 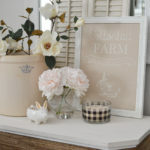 Goes with everything… farmhouse, vintage, cottage… it’s so me!! I love a little bit of everything and this fits right in. As more of the New Spring stuff comes in, I’ll make sure and share it. 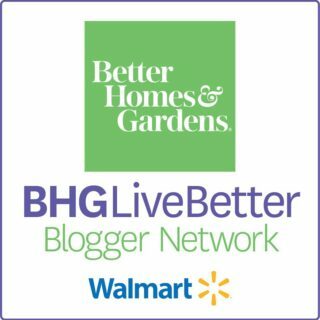 The Better Homes and Gardens line is so affordable, and I’ve yet to be disappointed with a single thing I’ve ordered! You can shop in store at Walmart (some things are in-store only) and also online at walmart.com – I like to do both. 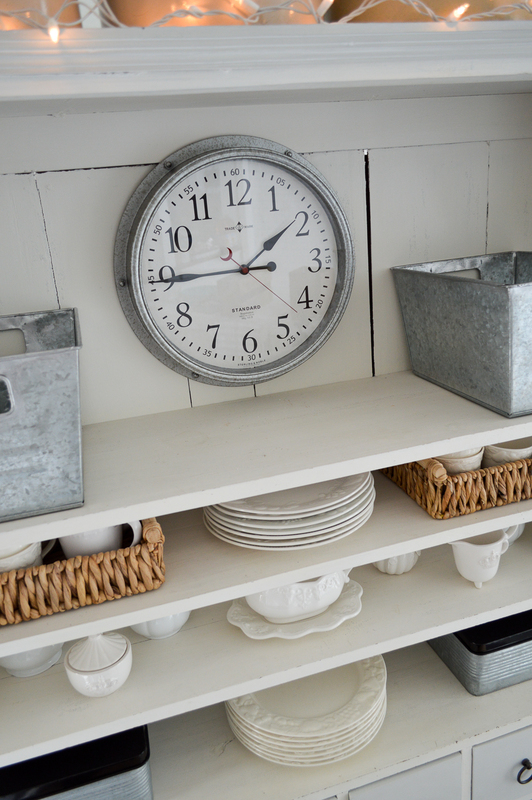 Getting the big stuff (like my Farmhouse shelf here) delivered right to your door is so convenient. 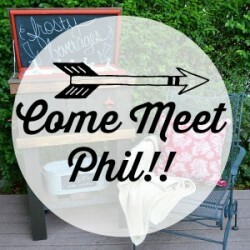 CLICK HERE to see all my BHG projects & posts! 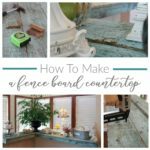 Some of the links in this post are affiliate links. That means, if you make a purchase, I may get a small commission, but your purchase price stays the same. You don’t pay a penny more. This support helps with the cost associated with running the blog. Thank you so much! Man, the galvanized stuff gets cuter every season doesn’t it!? Thanks Stacy, we really love this piece. “If it’s snowing where you are, don’t hate me” LOL!!! We’re in the 80’s so I think we beat you all…but laugh at us in 4 months when it’s 122! Love it all, so gorgeous. 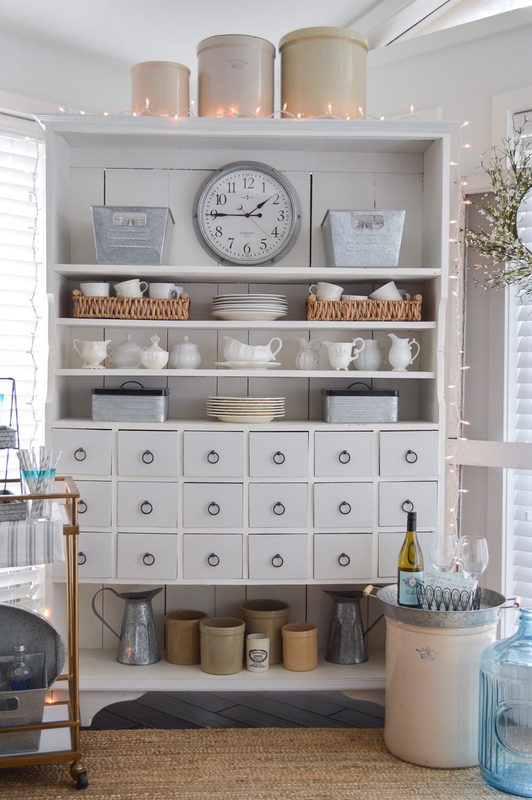 Adore seeing all the ways you style that darling cabinet! I do that to my mom & sis down in SoCal, when it’s 65* and we’ve got a nice breeze. It’s wonderful!! 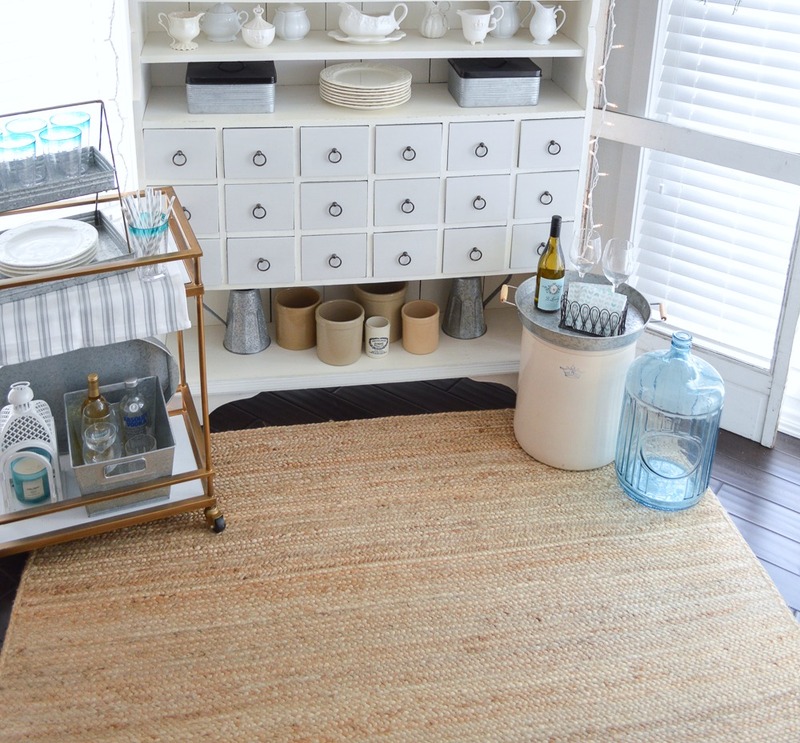 Loving all the galvanized goodies and your cabinet is super cute!! Now I want one!! Oh where did u find the big aqua jar. I so need one! Out junking! Took a long time, but finally stumbled on one that wasn’t a zillion bucks. 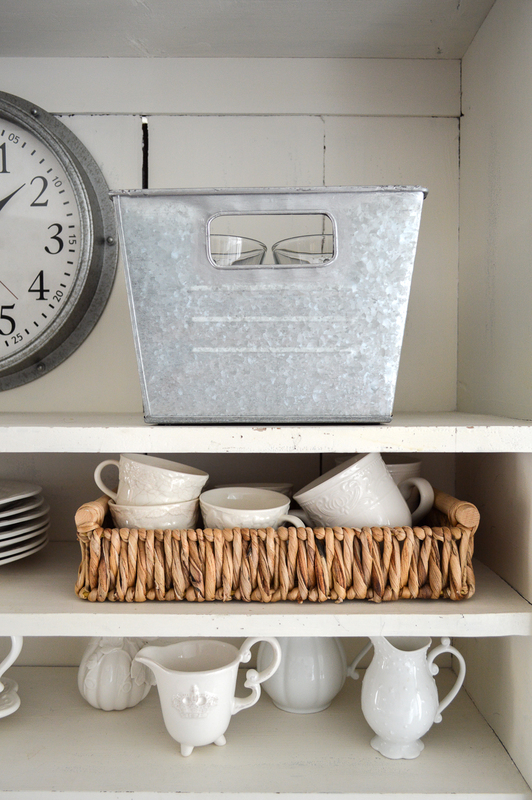 I am loving all the galvanized goodies! Everything looks so pretty!! Me too! I’m crazy for them. I love that they are so cheap… so I can buy them all. LOL!!!! 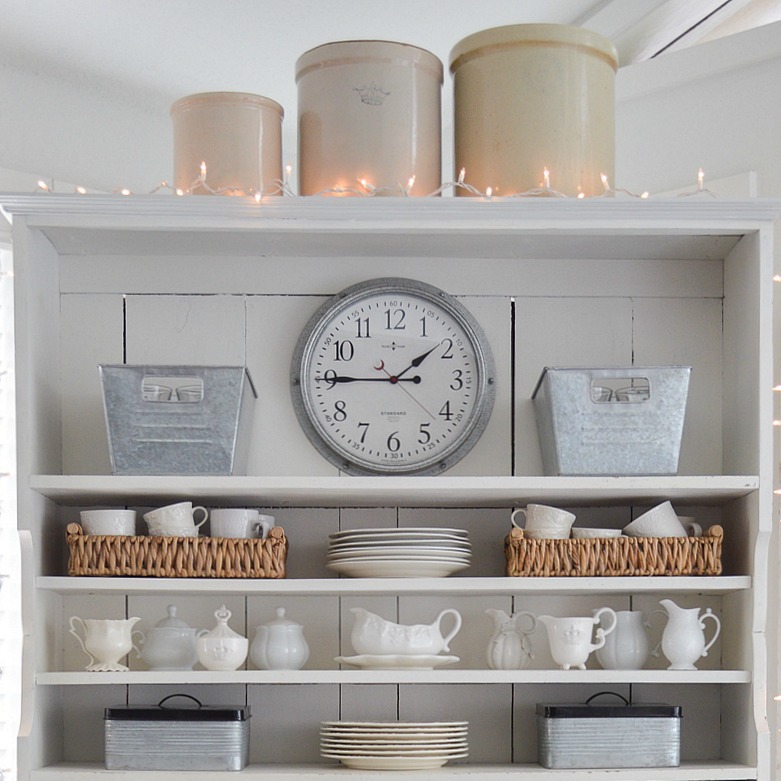 LOVE the wall clock! Thinking it would be lovely on the wall of our Airstream! (and then into the kitchen when her wheels stop rolling for awhile). I do too! It’s so indoor-outdoor. I like adding pieces on to my collection. Dreaming of Spring? 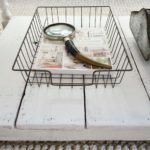 I've got some great Galvanized Metal Pieces to share from the Better Homes and Gardens BHG Line, Perfect for Entertaining and More!